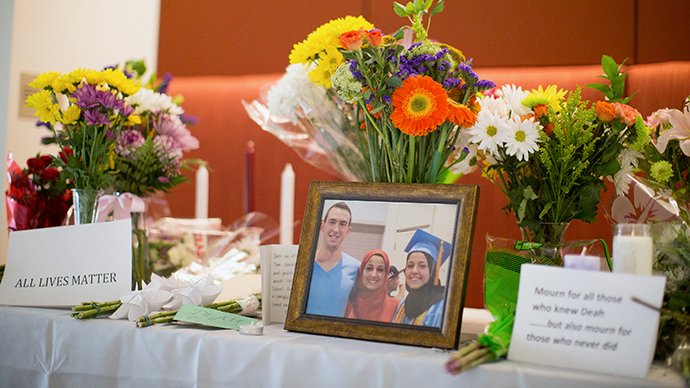 The man charged with fatally shooting three Muslim students in Chapel Hill, North Carolina, could be put to death if he is found guilty, a state judge ruled on Monday. Craig Stephen Hicks, 46, was indicted in February by a North Carolina grand jury on three counts of first-degree murder and one count of discharging a firearm into an occupied dwelling. He stands accused of killing his neighbors Deah Shaddy Barakat, 23, his wife Yusor Abu-Salha, 21, and her sister Razan Abu-Salha, 19. In court on Monday, prosecutors said they discovered Hicks’ blood on one of the victim’s pants as well as gunshot residue on Hicks’ hands, Reuters reported. Superior Court Judge Orlando Hudson ruled that based on all the evidence presented thus far, Hicks could face the death penalty if he’s convicted, according to local WRAL. During the shooting, Barakat was allegedly struck by Hicks several times, including in the head, while Yusor and Razan watched, Durham County Assistant District Attorney Jim Dornfried said at the hearing. The two women were then shot by Hicks, who went on to shoot them each in the head when they did not immediately die, Dornfried added, according to WRAL. The victims’ relatives have been adamant that Hicks killed the three students because they were Muslim and have pressed officials to charge him with a hate crime. Hicks had also routinely posted anti-religious comments on his Facebook page. So far, law enforcement have not indicated if they will seek such charges, but both local authorities and the FBI are conducting investigations into the matter. On Monday, the prosecution said the murder charges are the most serious, though, and that its first priority is to move ahead on those. "First-degree murder is the highest crime you can be convicted of and that is our focus,” District Attorney Roger Echols said to Reuters. In the wake of the shooting, Hicks’ wife Karen denied that hate for Muslims was the reason for the rampage. “I can say with my absolute belief that this incident had nothing to do with religion or victims’ faith, but was, in fact, related to the long-standing parking disputes that my husband had with the neighbors, our neighbors of various religions, races and creeds,” she said. Yousef Abu-Salha, the brother of Yusor and Razan, told RT that Hicks frequently “harassed” his sisters and Barakat.